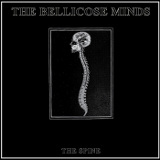 Hailing from my hometown of Portland, Oregon, The Bellicose Minds just released their first full-length last year, but due to some remastering, I ended up recently with their pre-LP demo instead. I'll review that shortly, but in the meantime, why not just go off and review the LP if it's out already and being offered on their Bandcamp page for five bucks, right? Especially since that LP, The Spine, turned out to be quite a fun record to listen to once I (inevitably) grabbed it. Part of the punk inheritance they bring to their sound, in addition to band members all adopting the same last name (all are named Bellicose) is the shortness of the songs. The songs are never above 4 minutes, and all have a quick, driving urgency to them -- the only song that even slightly slows down is Engulfed. With the initial track, Lessons, we get a busy guitar background, clean with a chorus effect, and a fast, dance-style drumbeat. The influences are all pretty clear -- Siouxsie and the Banshees and The Cure, maybe Killing Joke, are somewhere in there, but others are there too, buried under the surface. But this is by no means a replay of the past. Vocalist/guitarist Nick Bellicose, whose deep, low voice sounds a little like one might expect from Jim Morrison of The Doors if he'd started a punk band, can turn out a very modern rendition of what he was influenced by, and on the title track, he puts the flat, declaratory tones of a rapper into the almost tuneless vocals. This isn't the case for the following tracks, however; Bellicose Minds, which has far more melody. The bass line supports the guitar most of the time, but veers from it at times with little melodies of its own, and is heavily represented in the mix. All the tracks are good, but Call to Graves, in which the bass, guitar, and synth do a lovely minor-key harmony, is one of the best ones. With Nick Bellicose's shouting voice and all that dance-beat business, tracks like Visions of Pain might raise concerns that The Bellicose Minds is another follower of the 2000s post-punk revival scene that was horrifically overplayed on Clear Channel FM alternative rock stations, and maybe it is, but it's much fiercer and harder than anything mainstream, and metal devotees will enjoy that darkness and heaviness despite the album not being metal. In the end, the instrumental bridge on a track like this, or the partially shouted Banished Alone (Forever), can easily dispel concerns that this might turn into by-the-numbers repeats of 80s post-punk. It's good to see a band that can bring a legitimate offering in this genre to the table and turn out some genuinely good music while staying true to its musical roots. Filled with dark but pretty songs, The Spine is hard and aggressive while still being quite accessible, and now that I know these folks are floating around town, I'll have to check them out further. Meanwhile, their LP is accessible on Bandcamp, and I heartily recommend taking a peek.